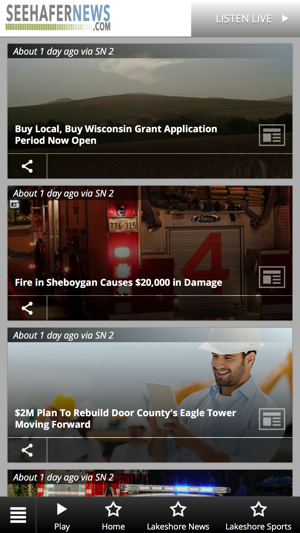 Stay informed of LOCAL NEWS, sports and events 24/7 with the Seehafer News App. UNDERSTANDABLE, INFORMATIVE, LOCAL at no cost to you. No pop up ads, JUST RELIABLE LOCAL NEWS ON YOUR SMARTPHONE. Seehafer News covering local and state news AND THE INFORMATION YOU CARE about. 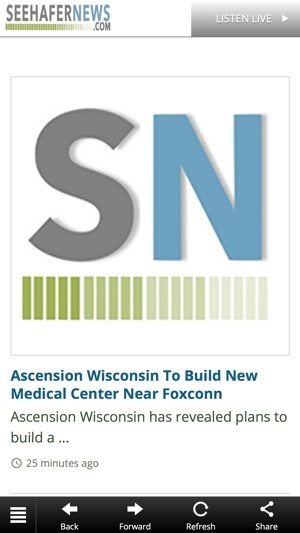 Featuring: News - Stay connected with local news and stories as well as the most popular news from around the state. Push Notifications - Opt into the Seehafer News push notifications and get the latest breaking news and severe weather closings/delays. Closings/Delays - Prepare for the day. Whether it’s school, work, appointments or anywhere else you have to be. Stay informed with our Severe Weather Closings & Delays page for Manitowoc County Sports - Seehafer News offers the foremost coverage of local sports for Manitowoc County. We also offer sports scores, schedules and post game wrap ups for Wisconsin’s favorite teams in the NFL and MLB with soundbites from the teams you love. As well as college football and basketball coverage. Help us grow: Seehafer News strives to be the lakeshore’s best news source. Based on your feedback we can offer the lakeshore what it needs. News you can rely on at no cost to you. Visit our website at https://www.seehafernews.com/contact/ and let us know how we can improve. Outstanding app and development quality. Easy to read, very intuitive...one steady stream of news that can be organized/sorted to the user’s preferences. © 2018 Seehafer Broadcasting Corp.